What We Do For You: PLANET APPAREL is a full service, professional design firm dedicated to conveying your business, club or event image as wearable, walking art. We specialize in computerized logo and image design and the production of high quality imprinted and embroidered apparel based on that artwork. You need only provide us with the basic artwork – from camera-ready art to a very simplistic idea. We will take it from there! Our knowledgeable team is ready to assist you and to do whatever it takes to get the job completed, on time, on budget, and the way you want it. GUARANTEED! 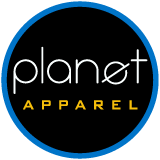 PLANET APPAREL has its origins in several companies, brought together to form a larger, stronger company. We can focus over 50 years of experience in the screen-printing and embroidery industries to respond to any form of apparel graphic needs you may have. We count among our customers Large Corporations and Small Business entrepreneurs; High Schools and Elementary Schools, College Fraternities and Sororities, Sporting teams from Little League to the professionals, Churches, the Military and Family Reunions. In short, PLANET APPAREL provides services to customers large and small, for single events or on repeat business, from all over the United States and abroad. We can help you select the best products to ensure that your image is portrayed the way you want at the best price possible. Jackets, Golf Shirts, Sweat Shirts, Denim Shirts, Caps, Tote Bags, Expandable Briefcases and etc. PLANET APPAREL offers top quality products from the industry leaders; from T-shirts, sweat shirts, caps, jackets, aprons, key advertising elements, and specialty goods, to almost anything that is capable of accepting printing or stitches. We are available 5 days a week from 8:30am to 4:00pm Pacific Time by Phone or E-Mail. We look forward to being of service to you!